Update #2: And it's over! Everything appears to have processed through just fine on both Dive opportunities this year! We will be building your orders in the coming days and weeks. Thank you everyone in taking part! Update #1: Good News, Everyone! If you happened to miss out on the Dumpster Dive this morning, you're in luck! We are going to offer the Dumpster Dive box one more time this afternoon from 1:00 pm MST to 1:10 pm MST! That way you will have one last opportunity to pick up a Dumpster Dive this year! To help you out, here is another handy countdown clock for Round Two of Dumpster Dive 2018! Today is Wednesday, November 14, but that's not all it is. It's also Dumpster Dive Day! At exactly 10 a.m. Mountain Standard Time, we will be opening the flood gates for you to get a chance to purchase your very own Dumpster Dive box. You will only have 10 minutes to successfully purchase your box, but we will be building to order this year, so as long as you get an order in it will be fulfilled in the order it was received. 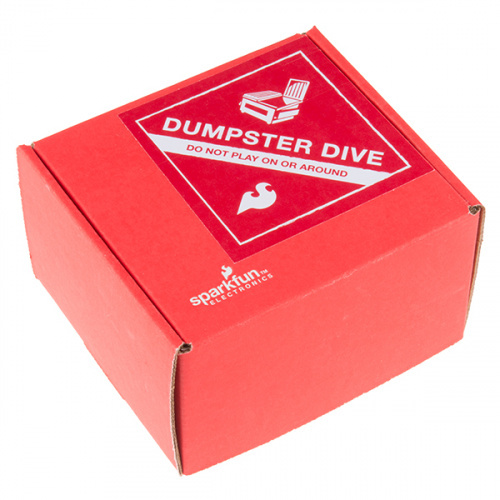 To place your order when the Dumpster Dive goes live, hit the button that says "Backorder" and your box will be assembled as quickly as we are able. Adding a Dumpster Dive box to an order may cause a delay. Be sure to uncheck “ship complete order” in your cart to avoid further delays in shipping in-stock items. We also will not allow combining orders. It may require some patience on your part, but we do intend to begin fulfilling orders within 30 days. The Dumpster Dive - 1/2 lb. Please remember, the Dumpster Dive is a gamble, and the contents are **not **guaranteed. We will not provide tech support or returns on any of the goods, since many are not products we ever supported, or might be returns with unknown defects. Every box will have many usable parts, but if you are looking for fully functioning, well-documented goods, we would advise against participating in Dumpster Dive. We will be providing updates once this hullabaloo is over, just to make sure everyone is in the know. Have a great day, and happy diving! For those unsure about what time this is (time zones and daylight savings make for weird calculations). Got my alarm all ready to go off right before the page goes live. I'm all ready! Not a bad haul in my order. Two redboards, a raspberry pi3 with a juice hat, some servo horns, and some random electronic stuff. In all honesty, I am glad you got some items you truly enjoy. Our goal this year was to provide just that! What I would like to see is a Reverse Dumpster Dive, in which I get to clean out my computer/radio room and somebody buys the stuff and hauls it away. Glad to hear that your purchase went smooth! Your friend is in luck because we are going to open up the Dumpster Dive for a second round today at 1:00 pm MST (until 1:10 pm MST)! If they don't see the back order button, try refreshing the screen, we get a little bogged down during this sale. Got my box on Saturday, just got around to opening it. Ended up with a bundle of alligator clips and larger gauge servo connectors, an assembled Danger Shield, what seems to be an earlier rev of the 8x7 led array(different silk screening). Plus a fair bit of screws, servo horns, and blank qwic gps boards. Overall very satisfied with the dumpster dive this year. So frustrated. I started to check out as guest but the site recognized my email and made me login.when I logged in, the site emptied my cart and by then I couldnât re-add the box. No worries! We are going to open up the Dumpster Dive for a second round today at 1:00 pm MST (until 1:10 pm MST)! Just ordered one. Hope it was in time! $10 shipping? So, $25 a box? Hope it's decent. Exactly why I skipped it...last time I did this it was sent FedEx Smart Post which takes over a week to travel across the US. A few days ago, I'd added a 60W 12V power supply to my order that totalled over $75 (without the supply). Because it ships from somewhere in Texas, when I went to check out, the $19 power supply invoked a $13 shipping charge, making it a $32 power supply, so I went back and deleted it. (I'm sure I can find a usable power supply around the house, or, if not, probably find one at a thrift store...). The rest of the order qualified for "free shipping". On the upside, at least SparkFun has "will call" for local customers. Several years ago I made several purchases from MicroChip, and although it would not be out of my way to stop by the shipping location, they made me pay FedEx to deliver the stuff to my house (and wait an extra day for it to get here).